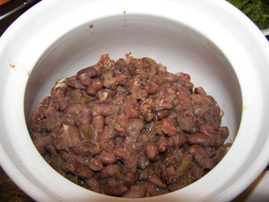 Put kombu in pot first, then add onions, celery and pinto beans. Cover with spring water and bring to a boil. Cover, reduce heat and simmer for 1 hour. Dilute the white miso with some of the cooking water and mix in. Simmer another 5 minutes and serve.